Our 2nd Rwandan coffee of the year and it’s turning out to be an excellent year for coffees from this country. This new selection is from a washing station next to the village of Kamiro in Southern Rwanda. First new coffee to roll out for 2015 hails from East Africa - Rwanda. This is an up and coming coffee origin that has plenty of potential for more quality coffee. We celebrate this new year with a great Rwandan coffee sourced by the folks at Coffee Shrub. Cocatu is a cooperative in the area of Tumba town, in the very mountainous Rulindo district, Northern Rwanda. Located at 1820 meters, the cooperative actually draws coffee from the surrounding hills up to 2100 meters. Cocatu receives support from a Kigali-based group who not only provides advice on technical agronomy, but also offers business support to the coop. The latter has been absent from many well-intentioned efforts to support cooperative coffee farmers. Cooperative leaders who do not have good business and accounting training can lead to mounting debt on the cooperative. Most cooperatives fail for lack of management, not lack of coffee quality. With this lot from Tumba, the farmer received 65% of the price paid by Coffee Shrub. The balance goes to the cooperative to process the coffee, the dry milling, transport and export costs. This price received by the farmer is higher than many other places in Rwanda. Such practices help to develop sustainability in coffee farming. We find this Rwandan lot pleasantly juicy and sweet. On the first sip, we taste a bundle of ripe stonefruits, like peaches, apricots, black prunes, red plums with hints of caramel in the finish. The sweetness is brown sugar-like and it gets more pronounced as it cools. The balance of this coffee makes this an enjoyable daily cup. We do notice this coffee taste significantly better with a slightly longer resting period post roast. So better grab a bag early. A little patience is required to wait for the flavours to open up. Producers: Smallholders in the surrounding areas deliver cherries to the washing station. Just back from the Southern hemisphere, the overhang of jet-lag has not stopped us from rolling out a new coffee after a 2.5week hiatus. Hailing from East Africa, we are excited to present this new coffee from Gitesi, Rwanda. There is always an element of “caution” when we cup samples of coffees from East Africa, like Rwanda and Burundi. One of the common problems with coffee from these origins - the potato-taste defect. This defect is not easily detectable visually in the green coffee or in roasted form. Up till now, there is no mechanical way to identify and remove infected beans. Hence, even with top coffees, an occasional cup will have this potato taste. One can smell the odour of freshly-peeled potato in the ground coffee and also from the smell when the coffee is brewed. While we are excited about high-quality Rwandan coffees, the potato-taste defect creates an obstacle for sourcing. Instead of choosing to sideline coffees from this region, we have chosen to buy these coffees, albeit with caution, so as to continue supporting the splendid work by these producers. The Gitesi washing station is at 1740 meters above sea level with 1,830 coffee farmers in the area that supply their cherries to this station each year. The station fosters a relationship with the farmers by paying an additional dividend at the end of each season based on performance. Gitesi was started in 2005 and has been building capacity each year. It is located in the sub-district of Karongi. This lot was aggregated by looking at all the day lot batches and combining the best ones. Early lots from Gitesi were not cupping consistently good, so were excluded by the guys from Coffee Shrub who have been sourcing from the region for a number of years. They found some tasty batches from the middle harvest to create this lot from Gitesi and we were lucky in getting hold of the last few lbs left in their Oakland warehouse. When ground, the coffee permeates with gentle floral aromatics. In the cup, we find juicy stonefruits, like peaches and apricots. Lively acidity with hints of mandarin orange and floral overtones. The finish is rather unique - sweet, honeyed herb-like. This coffee is superbly clean and its well-structured body provides the boost to make this a truly enjoyable brew. No potato taste found so far since we started roasting this coffee, this is a big relief. Kudos to the producers and Coffee Shrub for this excellent gem! Producers: 1830 smallholders in the surrounding areas deliver cherries to the washing station. During our travels last year, we had one of the most delicious cup from a Rwandan bean - Rwanda Musasa, roasted by HAS Bean. Since then, we have been on the lookout for interesting beans from Rwanda. This East African country has great altitudes, rich volcanic soils and an abundant labour force for coffee farming. Though coffee has always been a staple export in Rwanda, the country was never a player in the specialty coffee market. Over the past decade, there has been an impressive turnaround in quality. Through the work of several international development projects, foreign aid came in to kick-start a specialty coffee industry by building new coffee washing stations, organising farmers into cooperatives, and training local farmers, cuppers, and agronomists on quality. Since then, the coffee industry began to blossom & flourish in international markets. This new coffee is from Karengera, a coffee washing station in southwestern Rwanda. The town and mill of Karengera is in the Nyamasheke district that lies near Lake Kivu, and the borders of Burundi and Congo. This is a Bourbon varietal, wet-processed coffee. We have been previewing this bean for the past 2 weeks as our daily brew offering. This weekend, we are pleased to finally roll out this bean on our bean rack. This coffee reminds us of the inherent flavour characteristics of African beans. In the cup, we get berries with hints of lemony zest. Floral aromas at the beginning, followed by juicy strawberries & blueberries. This is a very clean cup. Sweetness comes through as it cools. We like brewing this with the Kalita wave dripper to highlight further the floral notes & clean finish. 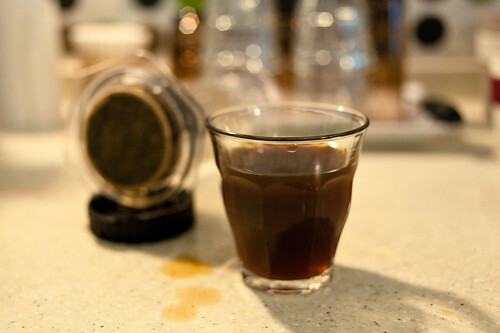 With the aeropress, the juiciness is further enhanced. Drop by for a cup & get a bag from our rack before it runs out. Limited stocks only.